All Lunt 50mm h-alpha Solar Telescope Systems require a Lunt Blocking Filter! This LS50 Solar Telescope Feather Touch from Lunt Solar Systems is a 50mm H-alpha, unobstructed, pressure-tuned, dedicated Hydrogen-alpha telescope with a bandpass of <0.75 A. It includes a B600 blocking filter and zoom eyepiece. The excitement of viewing our Star through a dedicated solar telescope is sure to provide many many hours of visual enjoyment and educational insights. Furthermore, this package is fully upgradeable at any time without ever having to go back to the factory. Therefore, as the Sun becomes increasingly more active, you will appreciate that the instrument can grow right along with it. 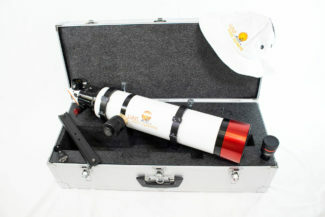 The Lunt LS50THa Solar Telescope B600, complete with a Pressure Tuner, provides the basic essentials perfect for a first time introduction to solar observing. Also it including the newest technology for fine tuning, allowing basic research of the Sun’s disk and some surface details. True Doppler Tuning (Pressure Tuning) allows for a shift into and away from the user. Amazingly, this adds a 3D-like component to the viewing experience. Meanwhile it has minimal effect on proms due to their being at the edge of the disk, it does have an effect on filaments and active regions on the surface. Also, when looking at a filament at the center of the Sun, the user has the ability to Doppler shift from the base of the filament to the tip. Therefore, you’ll be able to follow the filament through it’s structure toward you and away from you. All of this allows for enhanced visual and imaging capability for the observer as well as a research tool for the avid hobbyist. Most importantly, the pressure tuning system provides an order of magnitude more precision to the tuning of the desired features. 60 mm f/8.3 dedicated h-alpha solar telescope. An internal etalon with the Lunt LS60THa pressure-tuned adjustment allows for a <0.70 Angstrom bandpass.